Ganglionic cysts are non-cancerous soft tissue lumps that occur along any joint or tendon. They arise from degeneration within the joint capsule or tendon sheath of the joint, subsequently becoming filled with synovial fluid (Fig. 1). They are most commonly found around the hands and feet, with 60-70% of ganglions appearing on the dorsal aspect of the wrist. More common in females, they have a peak age of onset of 20-40 years old. In this article, we shall look at the risk factors, clinical features and management of ganglionic cysts. A ganglionic cyst typically presents as a smooth spherical painless lump adjacent to the joint affected (Fig. 2). It may have appeared suddenly or grown over time. In some cases, the cyst may have subsided initially, to then reappear at a later date. On examination, the lump will be soft and will transilluminate, however may mechanically restrict the full range of motion in the affected joint. If the cyst exerts any pressure upon an adjacent nerve(s), the patient may present with localised paresthesia, pain, or motor weakness. Tenosynovitis – no discrete mass, with the swelling tracking along the tendon. 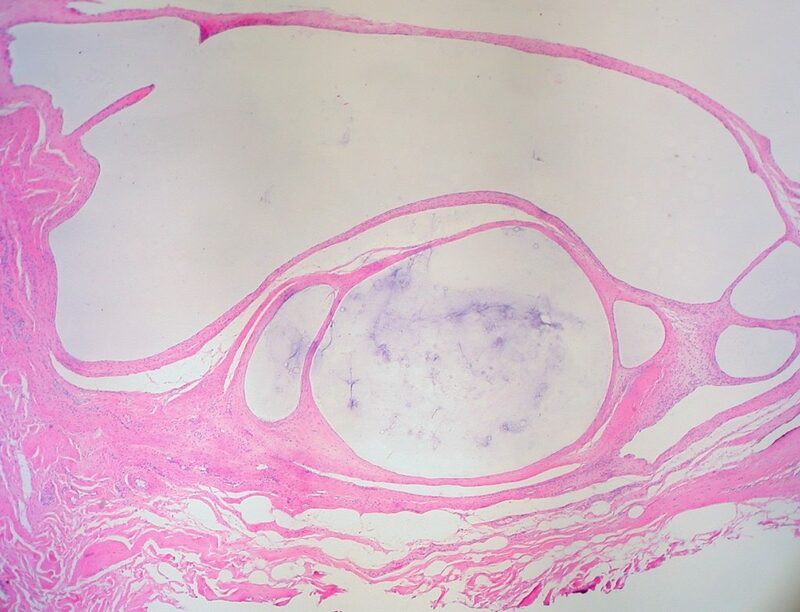 Giant cell tumour of tendon sheath – the mass is solid, does not translumuniate, and is fixed to the underlying sheath (therefore less mobile than a cyst). Lipoma – This will not be entirely spherical and does not trans-illuminate. Osteoarthritis – usually accompanied from a long standing OA of the scaphotrapeziotrapezoid joint, presenting as a palpable, hard, non-cystic, and immobile mass that does not trans-illuminate. Sarcoma – typically are not well circumscribed or mobile lesions. Most ganglion cysts are diagnosed clinically. A plain film radiograph may assist in ruling out osteoarthritis or bone malignancies as differentials, as ganglions cannot be visualised via X-ray. In uncertain cases, imaging via ultrasound or MRI can be done in order to assess the shape, size, and depth of the cyst. Due to their high sensitivity, such imaging may also pick up incidental cysts that have not yet grown large enough to be symptomatic. 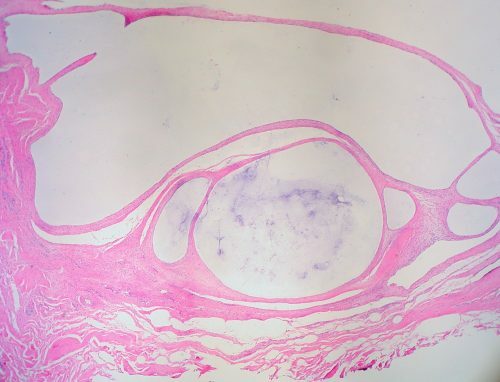 A ganglionic cyst can be aspirated for temporary symptomatic relief (however there is a high rate of recurrence) and any fluid extracted can be sent off for microscopy +/- cytology if required. If the cyst does not cause any pain, the usual recommended treatment is to simply monitor, as cysts often disappear spontaneously without further intervention. Aspiration +/- steroid injection*, although this is associated with infection and high rate of recurrence. *There is only limited evidence demonstrating a clear benefit of steroid injections in ganglion. Often reserved for symptomatic cases with recurrence following aspiration.